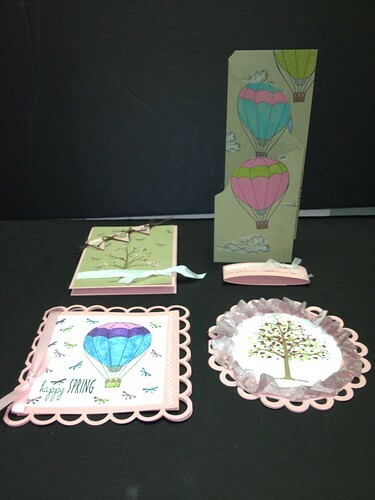 I have often gushed about my favorite two stamps from Deadbeat designs--the bare tree and the hot air balloon. I cut two of the cards with Lifestyle dies. These cookie cutter dies are quite large and make a great shaped card. The picture doesn't show the sparkle on the square card but the balloon and dragonflies are colored with glitter pens. I saw this idea for using an empty Valentine candy box and putting other items in the box. I thought this would be such a great idea. I didn't want to buy boxes of candy at the store so I went to Felicia's Scrapbooks and used her accucut machine to make my own boxes. 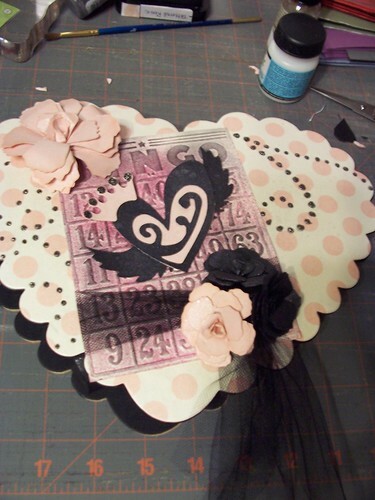 I cut 2 chipboard heart pieces and paper to cover both. Using the machine is nice because you can cut the paper to match the die. No tracing, trimming or sanding needed. The paper matches perfectly. I embellished this box for a crafty friend of mine. For the inside piece I created a box and a lid. I adhered the box to the bottom heart and the lid to the top heart. I filled the box with crafty goodies. 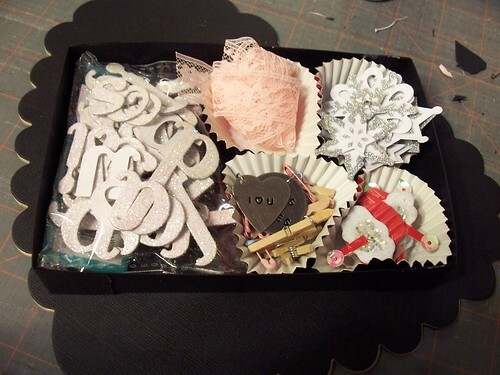 I am going to make boxes for the kids and their teachers as well. I think this is a fun, personal Valentine. I chose to not fill mine with candy but you could. Certainly a box of cake balls or homemade candy would look spiffy in it's own Valentine box. I'll post the others once I've finished them.